Ang Kentucky ay isang estado na matatagpuan sa Katimugang Estados Unidos. May 425 aktibong lungsod sa estado. Pindutin ang mga dobleng tatsulok sa itaas ng kolum upang iayos ang nilalaman ng talahanayan batay sa mga nakasaad sa kolum na yaon. A^ Maliban sa dalawa, lahat ng mga punong lungsod ng kondado ay mga lungsod. Kapuwang mga census-designated place (CDP) ang Whitley City ng Kondado ng McCreary) at Burlington ng Kondado ng Boone). Dalawang mga kondado ng estado ay may dalawahang punong lungsod: ang mga kabisera ng Kondado ng Campbell ay Alexandria at Newport, at ang mga kabisera ng Kondado ng Kenton ay Independence at Covington. B^ Unless otherwise noted, population and area are given according to the 2010 U.S. census. C^ Dates are those of the most recent formal incorporation, according to the records of the Commonwealth of Kentucky's Land Office. D^ Para sa mga lungsod na matatagpuan sa higit sa isang kondado, ang pangunahing kondado (ayon sa Kawanihan ng Senso ng Estados Unidos) ay unang nakatala. 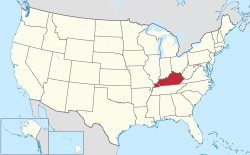 ↑ 1.0 1.1 Commonwealth of Kentucky. Office of the Secretary of State. Land Office. "425 Active Kentucky Cities" & individual pages. Accessed 15 July 2013. ↑ "Summary and Reference Guide to House Bill 331: City Classification Reform". Kentucky League of Cities. http://www.klc.org/UserFiles/files/ClassificationReformFACT(3).pdf. Hinango noong November 11, 2014. ↑ "City Classification Reform Fact Sheet Now Available". Kentucky League of Cities. http://www.klc.org/news/2422/City_Classification_Reform_Fact_Sheet_Now_Available. Hinango noong November 11, 2014. ↑ 4.0 4.1 4.2 "KLC Research Report: The Basics of Kentucky Cities". Kentucky League of Cities. September 2011. http://www.klc.org/UserFiles/TheBasics2011_Sept(2).pdf. Hinango noong 2012-08-04. ↑ Commonwealth of Kentucky. Office of the Secretary of State. Land Office. "122 County Seats". Accessed 15 July 2013. ↑ Kleber, John (1992). The Kentucky Encyclopedia. Lexington, Kentucky: The University Press of Kentucky. ISBN 0-8131-1772-0. ↑ 8.0 8.1 8.2 Established 1833. ↑ 10.0 10.1 10.2 Established 1834. ↑ 12.0 12.1 Established 1799. ↑ 13.0 13.1 13.2 13.3 13.4 Established 1812. ↑ 14.0 14.1 Originally inc. 1854. ↑ Originally inc. as Baird's Town. ↑ Originally inc. as Barlow City. ↑ Originally est. as Beatty. ↑ Established 1816. Originally inc. 1850. ↑ Originally inc. as Berryville. Renamed Berry Station in 1869. ↑ Originally inc. as Middletown. ↑ 24.0 24.1 Originally inc. 1880. ↑ Originally inc. as Bolin Green. City of Bowling Green. "History of Bowling Green: Beginnings". Accessed 22 July 2013. ↑ 26.0 26.1 Established 1835. ↑ Originally inc. as Breman. ↑ 29.0 29.1 Originally inc. 1828. ↑ Originally inc. as Calhoon. ↑ Previously incorporated 1871 and 1946. ↑ 32.0 32.1 32.2 Established 1840. ↑ New Campbellsburg separately inc. 1876; it later grew to include Old Campbellsburg, while taking the shorter name. ↑ 34.0 34.1 34.2 34.3 34.4 34.5 Established 1817. ↑ 35.0 35.1 35.2 35.3 Established 1818. ↑ Originally est. as Port William. ↑ 37.0 37.1 Established 1794. ↑ Originally inc. as Centre Town. ↑ Originally inc. as Stroud City. ↑ Established in 1873. Originally inc. 1880. ↑ Rennick (1988) lists Clay as having been reïncorporated in 1872. ↑ Also known as Coal Run. ↑ 47.0 47.1 47.2 47.3 Established 1820. ↑ 50.0 50.1 50.2 50.3 Established 1793. ↑ Originally inc. as Dawson City. ↑ Originally the separate cities of Brooklyn and Jamestown. ↑ Jamestown incorporated 1848; Brooklyn inc. 1849. ↑ 56.0 56.1 56.2 56.3 Established 1836. ↑ Summit Hills Heights incorporated 1962; Pius Heights inc. 1965; both annexed by Edgewood 1968. ↑ 58.0 58.1 58.2 58.3 Established 1797. ↑ Also known as Eubanks. ↑ 62.0 62.1 62.2 Established 1830. ↑ South Ft. Mitchell separately incorporated 1927; annexed in 1967. ↑ Originally inc. as Lebanon, then George Town. ↑ Kentucky Encyclopedia, p. 371. "Georgetown". University Press of Kentucky (Lexington), 1992. Accessed 26 July 2013. The Kentucky Land Office cannot provide a date for Georgetown's incorporation. ↑ Rennick, Robert. Kentucky Place Names, p. 115. "Germantown". University Press of Kentucky (Lexington), 1987. Accessed 26 July 2013. ↑ Graymoor originally inc. 1959. Devondale originally inc. 1958. ↑ Originally inc. as Greenupsburg. ↑ Originally inc. as Mt. Pleasant. ↑ Originally inc. as Minor Lane Heights. ↑ Originally inc. as District of Highlands. ↑ Established & originally inc. 1867. ↑ Originally incorporated 1941; Indian Hills-Cherokee Section separately inc. 1955. The City of Indian Hills website claims they were merged in 1999, but the Commonwealth of Kentucky's Land Office continues to list Indian Hills-Cherokee Section as an active municipality. ↑ Originally inc. as Eden. ↑ Originally inc. in 1888. ↑ Actual date unknown, but a 1938 court ruling claimed incorporation of at least 30 years. ↑ Established 1839. Originally inc. 1845. ↑ As of the 2000 U.S. census, per the Kentucky Land Office. ↑ Originally est. as Lawrence. ↑ This figure is for the Louisville/Jefferson County metro government (balance), those areas either unincorporated or within the City of Louisville proper before the 2003 merger of the urban and county governments. The population of the entire county was 741,096. ↑ Annexed the cities of Keeneland and Whipps Millgate in 2001. ↑ Originally est. as Greenville. ↑ Originally inc. in 1844. ↑ 97.0 97.1 Established 1824. ↑ 101.0 101.1 101.2 101.3 101.4 Actual date unknown. ↑ Established 1847. Originally inc. 1874. ↑ 104.0 104.1 104.2 Established 1792. ↑ Originally est. as Mount Vernon. ↑ Originally inc. as Norton. ↑ Originally est. as Hopewell. ↑ Established 1789. Originally inc. 1839. ↑ Originally est. as Pike and inc. as Piketon. ↑ Originally est. as Preston's Station. ↑ Originally inc. as Chinnville. ↑ Although city claims 1951 incorporation. ↑ Originally est. as Riverview. ↑ Earlier establishment legalized by General Assembly in 1816. ↑ Originally inc. 1871 in Gallatin Co.
↑ Established 1850. Originally inc. 1872 as Martinsburg. City gov't reäctivated 1930 & 1968. ↑ 125.0 125.1 Established 1825. ↑ Originally inc. as Slaughtersville. ↑ Merged with Strathmoor Gardens 1991. ↑ Sunny Acres separately incorporated 1953; annexed in 1959. Winston Park separately inc. 1929; annexed in 1972. ↑ 131.0 131.1 Established 1819. ↑ 132.0 132.1 Originally inc. 1840. ↑ Originally inc. as Fredericksburg. ↑ Established c. 1797. Originally inc. 1838. ↑ University of Kentucky. Kentucky Atlas & Gazetteer, "Wilmore". Accessed 8 July 2013. The Kentucky Land Office cannot provide a date for Wilmore's incorporation. ↑ City gov't reäctivated 1986. ↑ "County Seats of Kentucky's Counties". Kentucky Department for Libraries and Archives. 2008-10-07. http://www.kdla.ky.gov/resources/KYCountySeats.htm. Hinango noong 2009-03-28. ↑ "All places in Kentucky – DP-1. Profile of General Population and Housing Characteristics: 2010, 2010 Demographic Profile Data". U.S. Census Bureau. Sininop mula sa orihinal na pahina noong 2014-03-05. https://web.archive.org/web/20140305164937/http://factfinder2.census.gov/faces/tableservices/jsf/pages/productview.xhtml?pid=DEC_10_DP_DPDP1&prodType=table. Hinango noong 2011-12-31. Huling pagbabago: 17:13, 29 Abril 2018.